So Jonas "The Monster" Gustavsson has strutted his stuff on the world's stage and now can sit back and wait for the offers to come in. What also might make some NHL teams cringe is that Gustavsson posted a 2.82 goals against average and his glove hand was questioned by one scout I spoke to as well. Last night on Hockey Night In Canada, it was reported that the Jonas jostling was down to 4 teams, are the Oilers among the quartet? I spoke to someone in NHL management tonight who thought the Oilers had real shot at luring Gustavsson to Edmonton but that talks haven't started with any teams. Oilers Assistant G.M. Kevin Prendergast told TPS on April 21st that the team had some interest in the Swedish pipeman, but just how much interest Gustavsson has in Edmonton isn't known. I've been told because of Gustavsson's age he can only sign a one year deal, but that it will be loaded with bonuses. So do you go hard for him now when he could be a free agent in a year? If you're the Oilers it's a risk you have to take. They don't want to give Roloson a two year deal and after his play at the World's I think someone will give the 39 year old a 2 year pact. So why not take a chance on Gustavsson, even if it is for one year. Maybe during that span - provided he doesn't get cramps from sitting on the bench all year again - Jeff Deslauriers will blossom into a starting netminder. Or Gustavsson turns into Niklas Backstrom and you have a bonified number one goalie on your team. Gustavsson was supposed to be the 3rd keeper for Sweden, ranked after Stefan Liv and Johan Holmqvist. His mother is terminally ill and it was only at her insistance that he showed up in Switzerland. He'd just won the national championship and only had a mere week or so with her before leaving again. 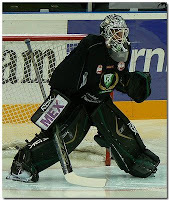 Due to injuries, he went from 3rd string to first string goalie and took a young Swedish team to the semi-finals. If anything, that shows tremendous character, perseverance, and focus to play through such difficulties. His stats at the WC are hardly much to pick at when one, considering the circumstances, recognizes that he was actually there. Just my two cents (or three kronor). good points, I'm sure the scouts and NHL management personell that I spoke with will take that into consideration when looking at deal. I still think it's a gamble the Oilers have to take for next year and maybe beyond. Thanks Jamie.